Central Jakarta Tourism and Culture Sub-dept. 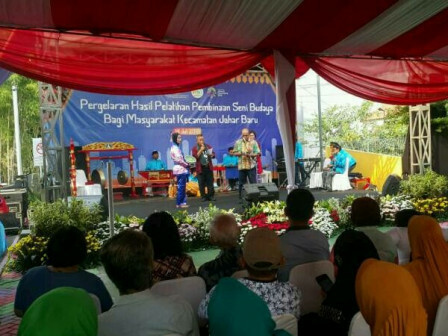 holds cultural arts performance for Johar Baru Sub-district residents in Johar Berseri RPTRA on Jalan Kramat Jaya Baru V. It is participated by RPTRA members.
" It is participated by 200 participants of music and traditional dance groups"
"This event is important for cultural preservation. Besides we can also find another talented Johar Baru Sub-district residents in arts," mentioned Bakwan Ferizan Ginting, Central Jakarta Assistant in Economy and Development (Asekbang), Saturday (7/14). According to him, art and culture coaching in Johar Baru provides positive activities for local residents. Meanwhile, Central Jakarta Tourism and Culture Sub-dept. Head, Sonti Pangaribuan informed, this event which is held this morning is participated by 200 people. "It is participated by 200 participants of music and traditional dance groups from kindergarten to senior high school levels," he stated.